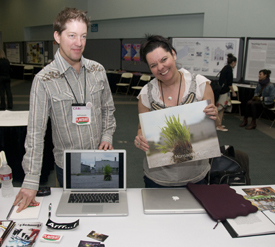 CAA’s Services to Artists Committee invites artist members to participate in ARTexchange, an open forum for sharing work at the 2013 Annual Conference. Free and open to the public, ARTexchange will be held on Friday, February 15, 5:30–7:30 PM, in a central location at the Hilton New York. A cash bar will be available. ARTexchange is an annual event showcasing the art of CAA members, who can exhibit their paintings, drawings, prints, photographs, sculptures, and digital works using the space on, above, and beneath a six-foot folding table. Artists may also construct temporary mini-installations and conduct performance, sound, and spoken-word pieces in their space. In the past, many ARTexchange participants found the event to be their favorite part of the conference, with the table parameter sparking creative displays. To be considered for ARTexchange in New York, please send your full name, your CAA member number, a brief description of the work you want to exhibit (no more than 150 words), and a link to your website to Lauren Stark, CAA manager of programs. Artists presenting performance or sound art, spoken word, or technology-based work, including laptop presentations, must add a few sentences about their plans. Accepted participants will receive an email confirmation. Because ARTexchange is a popular venue with limited space, early applicants will be given preference. Deadline: December 14, 2012. Participants are responsible for their work; CAA is not liable for losses or damages. Sale of work is not permitted. Participants may not hang artworks on walls or run power cords from laptops or other electronic devices to outlets—bring fully charged batteries. CAA has partnered with Tutku Tours to provide an exclusive offer for its members to spend thirteen days exploring the ancient and contemporary sides of Turkey, from April 26 to May 10, 2013. Highlights of the Art of Turkey trip include stops in Istanbul, Izmir, Cappadocia, Troy, Ephesus, and Pamukkale. The tour begins with three full days in Istanbul—the “city located on two continents”—where travelers will visit the major attractions, including the Blue Mosque and Hagia Sophia, and also get to know the city’s vibrant street life and local art scene. Next, the tour will visit the ancient city of Troy and the Pergamum acropolis, and also the less-trodden destination of Ayvalık, a small town on the northwestern Aegean coast of Turkey. After several days of immersion in the ancient world, the group will pay a visit to the second International Izmir Art Biennial, one of the largest international art events in the country that will include more than three hundred artists; Seba Uğurtan, the biennial’s founder, will give tour participants an exclusive overview of the exhibition. The Art of Turkey Tour will also provide CAA members with time for rest and relaxation. It will stop at the port city of Ephesus to visit a carpet school, along with an overnight stay at a spa hotel at the Pamukkale hot springs. The trip will conclude with a full day in Cappadocia, where travelers will explore the Goreme Open Air Museum, a vast collection of painted cave-churches dating from 1000 AD. Getting There: Turkish Airlines provides nonstop, direct flights from the United States and Canada, leaving from New York, Los Angeles, Chicago, Washington, DC, and Toronto. Land and Air Rates: $3,990 per person for a double room; $4,780 per person for a single room. For a detailed, day-by-day tour itinerary, please download and review the Art of Turkey brochure. 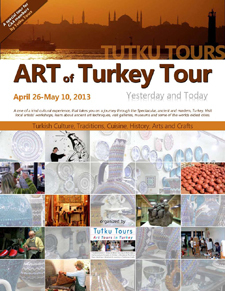 Tutku Tours will host demonstrations and lectures on art in Turkey at its exhibit booth (#100) in the Book and Trade Fair at CAA’s 2013 Annual Conference in New York. CAA has extended the deadline for session proposals for the 2014 Annual Conference in Chicago to Friday, September 14, 2012. Conference sessions cover the breadth of current thought and research in art, art and architectural history, theory and criticism, pedagogical issues, museum and curatorial practice, conservation, and developments in technology. The 2014 program is shaped by four broad submission categories: Historical Studies, Contemporary Issues/Studio Art, Educational and Professional Practices, and Open Forms. For Open Forms, members may submit themed panels that feature alternative formats such as panel discussions or interviews, or even sessions that provide alternate speaking lengths, rather than the usual five speakers in twenty-minute presentations. You must be a current CAA member in order to submit a proposal. Please visit www.collegeart.org/proposals/2014 for complete details on the process. Mark Staff Brandl. Saint Mangen Church and Exhibition Space, Saint Gallen, Switzerland, May 25–August 17, 2012. Podographs in Church. Monoprints. Dawn Roe. Screen Space, Melbourne, Victoria, Australia, June 29–July 21, 2012. Goldfields. Video installation. Elise Dodeles. Quiet Life Gallery, Lambertville, NJ, August 10–September 30, 2012. Fearless: Fighters’ Portraits by Elise Dodeles. Painting. Jan Wurm. Christine Fréchard Gallery, Pittsburgh, Pennsylvania, August 18–September 21, 2012. Jan Wurm: Serious Play. Painting. Adriane Herman. Western Exhibitions, Chicago, Illinois, May 25–June 30, 2012. Adriane Herman. Mixed media. Francis Cape. ICA at MECA, Porteous Building, Maine College of Art, Portland, Maine, June 13-August 5, 2012. Utopian Benches. Sculpture. Thomas Lail. Architecture Omni, Omi International Arts Center, Ghent, New York, July 7–late 2012. Thomas Lail: Notes for the Future. Xerography painting, works on paper, and outdoor sculpture. Reni Gower. Sawhill Gallery, James Madison University, Harrisonburg, Virginia, August 27–October 13, 2012. Strange Loops: Thirty Years of Painting. Painting. Maria Lino. Patricia and Philip Frost Art Museum, Florida International University, Miami, Florida, July 18–September 30, 2012. Shared Threads: Maria Lino’s Portrait of a Shipibo Healer. Video. Jennifer Palmer. Westbrook Gallery, Ferst Center for the Arts, Georgia Institute of Technology, Atlanta, Georgia, July 2–August 31, 2012. Lost in the Sea. Painting and drawing. Diane Burko. LewAllen Gallery, Santa Fe, New Mexico, June 8–July 15, 2012. Diane Burko: Water Matters. Painting. Ellen Carey. Joseph Bellows Gallery, La Jolla, California, June 2–July 14, 2012. Ellen Carey: Photography Degree Zero. Polaroid lens-based art. Sinclair Bell, assistant professor of art history at Northern Illinois University in Dekalb, has been granted tenure and promoted to the rank of associate professor. Bell is a specialist in ancient Roman and Etruscan art. Charles S. Buchanan, associate professor of art and architectural history at Ohio University in Athens, has been named interim director of the School of Interdisciplinary Arts, a doctoral program within the university. Amy Hauft, an artist and chair of the Sculpture Department at Virginia Commonwealth University in Richmond, has joined the University of Texas at Austin as the Leslie Waggener Professor of Art in the College of Fine Arts. Kriszta Kotsis, an assistant professor of ancient and medieval art, has been granted tenure by the University of Puget Sound in Tacoma, Washington. Sara M. Picard has accepted a position as assistant professor of art history at Rhode Island College in Providence. Jack Risley, an artist and associate dean of academic affairs at Virginia Commonwealth University in Richmond, has been hired by the University of Texas at Austin to be Ruth Head Centennial Professor and chair of the school’s Department of Art and Art History. Karen M. Wirth, an artist, professor, and former chair of the Fine Arts Department at the Minneapolis College of Art and Design in Minnesota, has been appointed vice president of academic affairs at her school. Lisa Hostetler, curator of photographs at the Milwaukee Art Museum in Wisconsin, will join the Smithsonian American Art Museum in Washington, DC, as its new curator of photography. In her seven years at the Milwaukee Art Museum, Hostetler was responsible for many critically acclaimed exhibitions, including the first major survey of the photographer Taryn Simon. Barbara Buhler Lynes, curator at the Georgia O’Keeffe Museum in Santa Fe, New Mexico, has resigned her position at the museum. Lynes was the museum’s first curator as well as its Emily Fisher Landau Director of the museum’s research center. Patricia McDonnell, director of the Ulrich Museum of Art at Wichita State University in Kansas, has accepted a position as the executive director of the Wichita Art Museum. A member of the CAA Board of Directors, McDonnell succeeds Charles K. Steiner, who stepped down as executive director at the end of 2011 after twelve years of service. Amy Meyers, director of the Yale Center for British Art in New Haven, Connecticut, has been reappointed for a third five-year term as director. Matthew Palczynski, staff lecturer for Western art at the Philadelphia Museum of Art in Pennsylvania, has been appointed curator of the Woodmere Art Museum, also in Philadelphia. Daniel H. Weiss, a scholar of medieval art and the president of Lafayette College in Easton, Pennsylvania, has been chosed to lead Haverford College in Haverford, Pennsylvania, as president, He begins the new position in July 2013. Namita Gupta Wiggers, a curator at the Museum of Contemporary Craft, in partnership with Pacific Northwest College of Art in Portland, Oregon, has been named the director and chief curator of the museum. Thomas W. Lollar, a ceramicist and scholar of fine-art prints, has left his position as director of the Brodsky Center for Innovative Editions at Rutgers University in New Brunswick, New Jersey. He will join Paul Limperopulos as codirector of the Benefit Print Project in New York. Dena Muller has been appointed to the newly established position of director of new initiatives at the New York Foundation for the Arts, based in Brooklyn. Previously, Muller was the executive director at ArtTable in New York, an organization that promotes women in the arts through outreach programs and mentorship. The Amon Carter Museum of American Art in Fort Worth, Texas, has received a $75,000 grant from the National Endowment for the Humanities to support an online cataloguing project of eight American photographers of the twentieth century: Carlotta Corpron, Nell Dorr, Laura Gilpin, Eliot Porter, Helen Post, Clara Sipprell, Erwin E. Smith, and Karl Struss. The Cleveland Museum of Art in Ohio is creating an online catalogue of fifty-four British portrait miniatures from the museum’s collection of miniature painting from the seventeenth, eighteenth, and nineteenth centuries. The catalogue will allow the paintings to be viewed at actual size and in great detail; an essay by Cory Korkow, a curatorial fellow at the museum, will accompany the work. The Indianapolis Museum of Art in Indiana has received a $190,000 grant from the National Endowment for the Humanities to digitize and catalogue primary materials about Miller House and Garden, a modernist home designed by Eero Saarinen that was registered as a national historic landmark in 2000 and is owned and cared for by the museum. The collection includes blueprints, correspondence, textile samples, sketches, and photographs related to the house. The University of the Arts in Philadelphia, Pennsylvania, is the recipient of a $500,000 gift from a university trustee, Irvin J. Borowsky, and his wife, Laurie Wagman, to establish the annual Irvin Borowsky Prize in Glass Art. The donation will also fund the Irvin Borowsky Center for Glass Arts, a 3,700-square-foot studio and exhibition space. The Wadsworth Atheneum Museum of Art in Hartford, Connecticut, has been awarded a $2 million grant from the Connecticut State Bond Commission and an additional $2.5 million from foundations and individuals to support an extensive renovation due to be completed in 2014. Affecting 70,000 square feet, the project will focus on creating additional gallery space, energy conservation, and improving storage facilities. 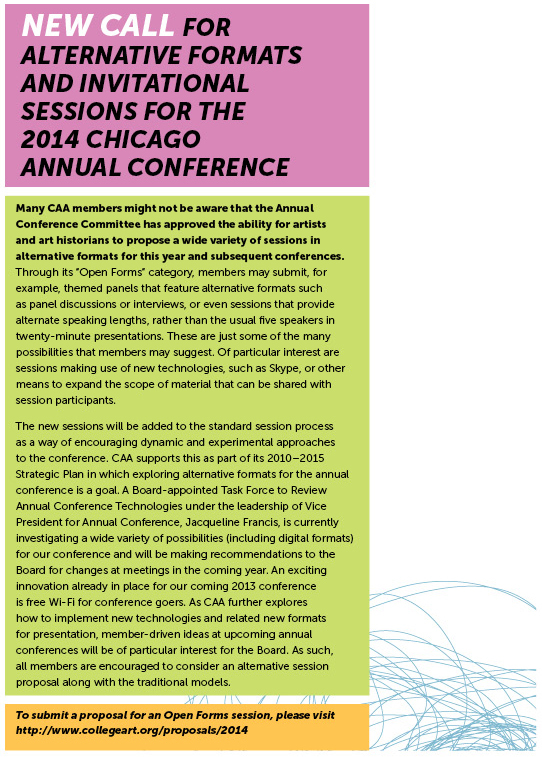 Many CAA members might not be aware that the Annual Conference Committee has approved the ability for artists and art historians to propose a wide variety of sessions in alternative formats for this year and subsequent conferences. Through its Open Forms category, members may submit, for example, themed panels that feature alternative formats such as panel discussions or interviews, or even sessions that provide alternate speaking lengths, rather than the usual five speakers in twenty-minute presentations. These are just some of the many possibilities that members may suggest. Of particular interest are sessions making use of new technologies, such as Skype, or other means to expand the scope of material that can be shared with session participants. The new sessions will be added to the standard session process as a way of encouraging dynamic and experimental approaches to the conference. CAA supports this as part of its 2010–2015 Strategic Plan in which exploring alternative formats for the annual conference is a goal. A Board of Directors–appointed Task Force to Review Annual Conference Technologies, under the leadership of CAA’s vice president for Annual Conference, Jacqueline Francis, is currently investigating a wide variety of possibilities (including digital formats) for our conference and will be making recommendations to the board for changes at meetings in the coming year. An exciting innovation already in place for our coming 2013 conference is free Wi-Fi for conference goers. As CAA further explores how to implement new technologies and related new formats for presentation, member-driven ideas at upcoming Annual Conferences will be of particular interest for the board. As such, all members are encouraged to consider an alternative session proposal along with the traditional models. To submit a proposal for an Open Forms session, please visit http://www.collegeart.org/proposals/2014. Deadline extended: September 14, 2012. Hartmut Austen, a painter, has been appointed Grant Wood Fellow in Painting and Drawing at the School of Art and Art History at the University of Iowa in Iowa City for academic year 2012–13. The fellowship comes with the faculty rank of visiting assistant professor; studio space is provided for independent work. Julia Whitney Barnes, an artist based in Brooklyn, New York, received a commission to design and install a permanent public mosaic at the Sirovich Senior Center in Manhattan’s East Village, where she had been an artist in residence. With support from the Lower Manhattan Cultural Council and the New York City Department of Cultural Affairs, Barnes unveiled the mosaic in June 2012. Caetlynn Booth, an American artist living and working in Berlin, Germany, has been awarded a DAAD Fellowship for 2012–13 and a grant from the John Hanson Kittredge Fund for her current painting and research project, “The Work of Adam Elsheimer and the Spiritual Power of Painting,” which she began as a Fulbright fellow in 2011. Katherine Colin, a painter and an MFA student at the University of Dallas in Texas, has won a 2012 Arch and Anne Giles Kimbrough Fund Award from the Dallas Museum of Art. Open to residents of Texas under the age of thirty, the Kimbrough fund was established in 1980 to recognize exceptional talent and potential in young visual artists who show a commitment to continuing their artistic endeavors. Jess Riva Cooper, a sculptor from Toronto, Canada, has been awarded a scholarship for a summer residency at the Archie Bray Foundation in Helena, Montana. Cooper’s residency will be funded by a Windgate Scholarship, which provides a $700 grant for each recipient. Andrew Gilliatt, a ceramicist, has received the Speyer Fellowship from the Archie Bray Foundation in Helena, Montana. The fellowship comprises a $5,000 award and a one-year residency at the foundation to pursue independent work. Heather Ryan Kelley, professor of art at McNeese State University in Lake Charles, Louisiana, has been awarded a residency at the Cill Rialaig Project in County Kerry, Ireland. She will work on a series of prints, artist books, and collages based on James Joyce’s Finnegans Wake. Debbie Kupinsky, a ceramicist and sculptor from Appleton, Wisconsin, has been awarded a Windgate Scholarship of $700 to attend a summer residency at the Archie Bray Foundation in Helena, Montana. Matthew Levy, a PhD candidate at the Institute of Fine Arts, New York University, has accepted a Henry Luce Foundation/American Council of Learned Societies Dissertation Fellowship in American Art. Levy is working on a dissertation, “Abstract Painting after the Minimalist Critiques: Robert Mangold, David Novros, Jo Baer,” that examines the practice of three painters. Mike Osbourne, an artist based in Austin, Texas, whose work examines the intersection of technology, urbanism, and the landscape, has earned a 2012 Otis and Velma Dozier Travel Grant from the Dallas Museum of Art. Osborne will travel to the Brazil and Peru to conduct research for a photography and video project that will address how the mythologized Amazonian landscape collides with the forces of modernity. Britt Ragsdale, an artist based in Houston, Texas, has been awarded an Individual Artist Grant from the Houston Arts Alliance. The competitive grant program supports local artists working in a range of media and promotes the city as a magnet for cultural tourism. Murtaza Vali, a freelance art critic and curator, has been named guest curator of the fifth edition of the Abraaj Capitol Art Prize. Vali joins the committee that will select the five winning artists; he will also assist the artists in completing their projects, to be exhibited at Art Dubai in March 2013. Sandra Zalman, an assistant professor of art history at the University of Houston in Texas, has been granted an American Council of Learned Societies Fellowship for her project, “Surrealism and its Afterlife in American Art 1936–1986,” which examines the far-reaching influence Surrealism had on mass culture in the United States. Katie Grace McGowan and Jon Brumit. Post-Industrial Complex. Museum of Contemporary Art Detroit, Detroit, Michigan, May 11–July 29, 2012. Matthew Palczynski. Haunting Narratives: Detours from Philadelphia Realism, 1935 to the Present. Woodmere Art Museum, Philadelphia, Pennsylvania, May 12–July 15, 2012. Matthew Palczynski. Salvatore Pinto: A Retrospective Celebrating the Barnes Legacy. Woodmere Art Museum, Philadelphia, Pennsylvania, May 12–July 15, 2012. Jennifer Wilkinson. Bivalence: Working Space 12. Cuchifritos, Essex Street Market, New York, July 12–August 12, 2012.